This Vera Mont dress will carry you to the most special of occasions in style this season. 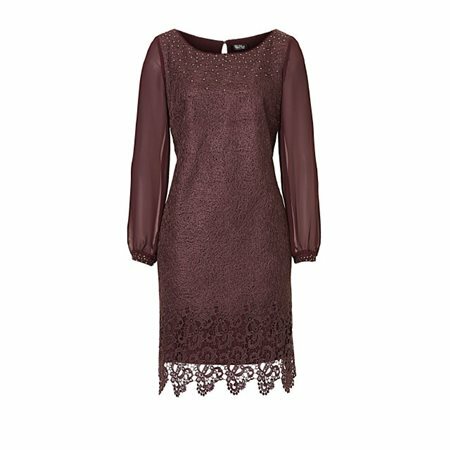 The dress is presented in a beautifully rich purple tone and has a gorgeous overlay which is intricately woven together to give a stunning textured finish. The bottom of the dress has a contrasting pattern that is finished with a charming scallop hem. The dress has a round neckline which features some subtle sequin detailing giving a lovely dazzling look. The sleeves are presented in a semi-sheer chiffon fabric and finish with a beautiful sequin cuff hem. This dress will turn heads for all the right reasons this season.